Clog resistant marker tip; writes through dusty, wet and oily surfaces; durable marker tip for writing on concrete, OSB, and rough surfaces; built-in hard hat storage clip; fine point; ink dries in seconds; lanyard hole; anti-roll body design; non-toxic ink. Clog resistant marker tip; writes through dusty, wet and oily surfaces; durable marker tip for writing on concrete, OSB, and rough surfaces; built-in hard hat storage clip; fine point; ink dries in seconds; lanyard hole; anti-roll body design; non-toxic ink. New anchor ring provided with each replacement line. 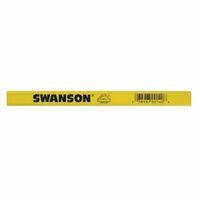 Swanson Carpenter Pencil, High Visibility, Yellow, 7 in Length, Flat Lead, For Professional Use New anchor ring provided with each replacement line. Standard grade marking chalk formulated to achieve a perfect line every time with 4?5 strikes usual line yield. Brilliant color tones provide strong, sharp lines. Great flow for easy reel fill-up. Rough mason line construction holds chalk well. Resistant to rot and abrasion, is not damaged by cement and alkalies. May be stored wet without damage to its fibers. Ties easily and knots hold securely; .053" nominal diameter. #1 size Twisted seine twine/mason line. For continual rather than disposable use. Specially treated to knot securely. Durable. Ideal resistance to abrasion, rot, mildew and chemicals. Use for repair, fishing and duck decoy line, chalk and mason line. White. Writes on all glazed and slick surfaces; Red, Blue, and Yellow. Interior use; eliminates need for primer before painting. Cleanly wipes off smooth and rough surfaces. The flip-top cap seals the chalk in an airtight chamber, keeping out moisture and reducing the risk of clumping. Carpenter Pencil never needs sharpening! Each packaged contains 2 pencils with 8 tips and an additional 16 bonus cartridges. New anchor ring provided with each replacement line. Professional grade marking dye formulated to achieve a perfect line every time with 8-10 strikes usual line yield. Brilliant color tones, weather proof color, water resistant lines hold your mark. Great flow for easy box fill-up. Professional grade marking dye formulated to achieve a perfect line every time with 8-10 strikes usual line yield. Brilliant color tones, weather proof color, water resistant lines hold your mark. Great flow for easy box fill-up. Professional grade marking dye formulated to achieve a perfect line every time with 8-10 strikes usual line yield. Brilliant color tones, weather proof color, water resistant lines hold your mark. Great flow for easy box fill-up.